At long last, you can finally give the gift of iPhone, iPod touch and iPad apps. To gift and app just select the drop down menu next to the price of an app in the iTunes app store, and choose the “Gift This App” option. From there you will just have to fill in your information, and the reciepient’s email address and type in a personal message. 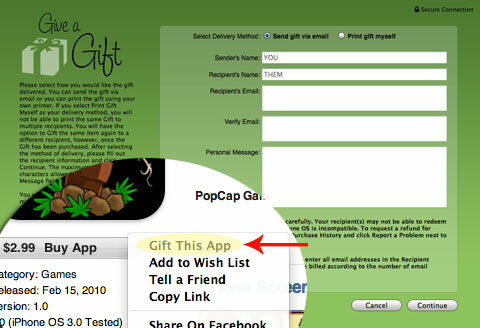 Note: Gifts can not be used for in-app purchases and or in-app subscriptions, upgrades, or the iPod touch OS. Some gifts require compatible hardware and parental control settings to be redeemed. Gift in the US App Store can be purchased by, and for people in the United States. Gifts are non-refundable. Read Apple’s iTunes terms of service for the details.